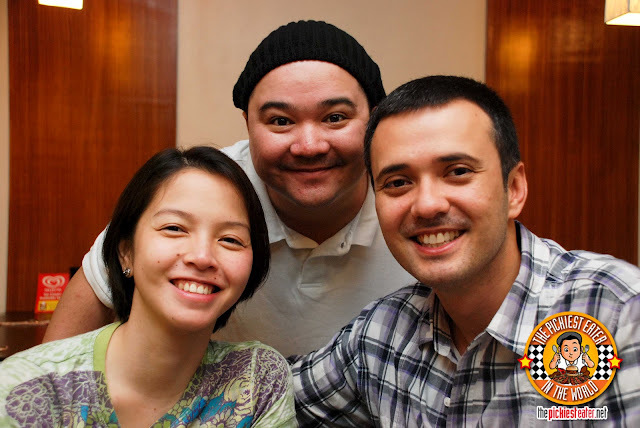 It was a rainy Saturday morning when Rina and I drove to Quezon City for her doctor's appointment. I don't go to QC very much anymore.. which is sad because I spent four years living in my grandfather's house before moving to our place in Antipolo. We lived near the Timog-Tomas Morato area, and even back then, it was lined with a number of restaurants, with the more popular ones being Mario's, Dulcinea, and Anabel's. 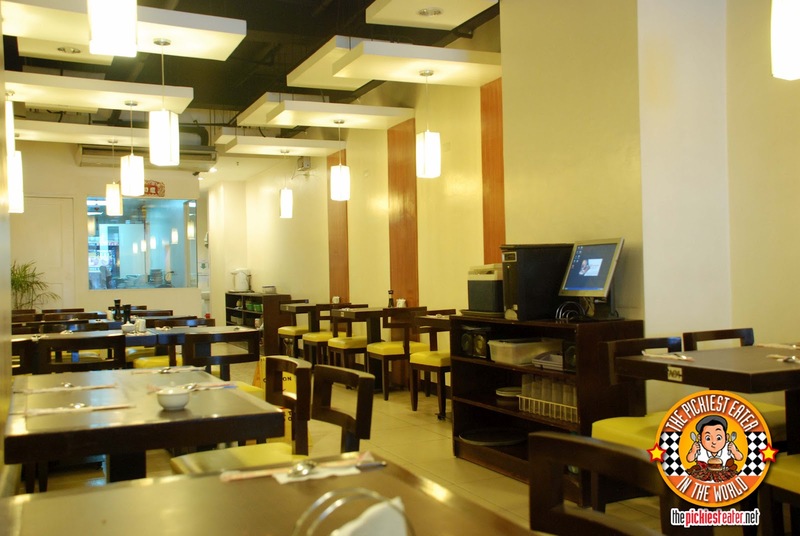 Nowadays, the area is loaded with an eclectic selection of restaurants to choose from. It's a little bit annoying knowing that there are hundreds of these wonderful restaurants for me to try, but most of them weren't there when I was living just a few blocks away from them. 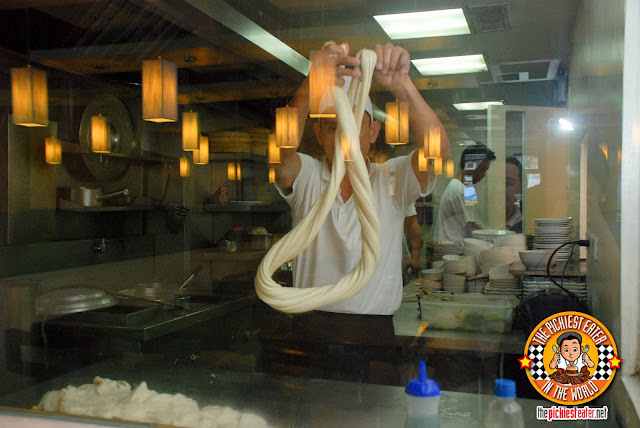 One such restaurant, is Kanzhu Hand Pulled Noodles. I hadn't been to that area since my visit to Penpen, so I was fortunate to find out about this restaurant from the Group Buying site, CashCashPinoy. Forgive me for sharing yet another adventure from a Chinese restaurant, but I wanted to use my voucher before it expired. Besides, I couldn't resist the allure of authentic "Hand pulled noodles". 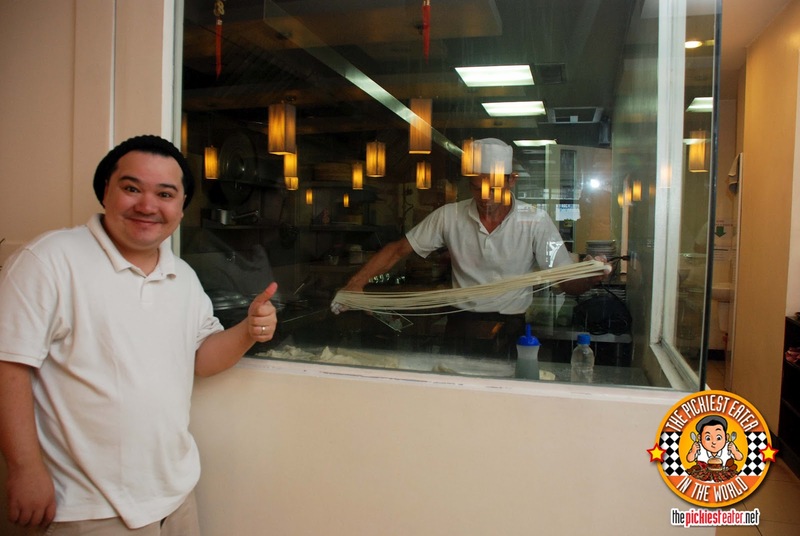 Kanzhu Hand Pulled Noodles Quezon City branch is located along Timog Avenue, near the Shell Station going towards Quezon Avenue (I found the name of the building, "Prince Jun" kinda funny.. I doubt there'd be very many Kings that would name their son, "Jun"). The restaurant is a simple, nice and cozy spot, that uses mirrors to make it look bigger than it actually is. You can clearly see the kitchen through a glass window, which I found out, has a very special use. The area was very clean, and the staff was very hospitable and attentive. 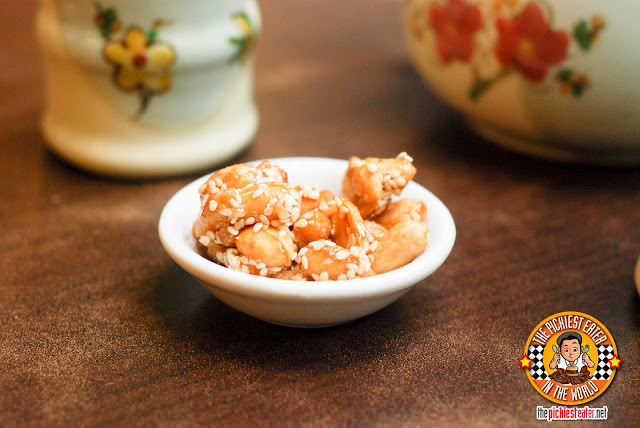 They started off the meal by giving us a small plate of Honey Roasted Peanuts sprinkled with sesame seeds. I'm not planning to review a bowl of nuts, but I have to admit that the seeds were a nice touch to the sweet, crunchy peanuts. Like a good pupil to the not-so-ancient arts of food blogging, I studied the menu of Kanzhu before we got there, and immediately became fascinated by the thought of their Lamb Dumplings (P120 for 7pcs). It wasn't included in my voucher so if I wanted to order it, it would have to be on top of my bill. 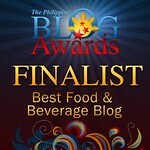 I was crossing my fingers that it would be totally worth it, and guess what? I loved it! The moment that steaming hot ball of awesomeness is in your mouth, it bursts with the unmistakable flavor of one of my favorite meats.. you guess it, Lamb! 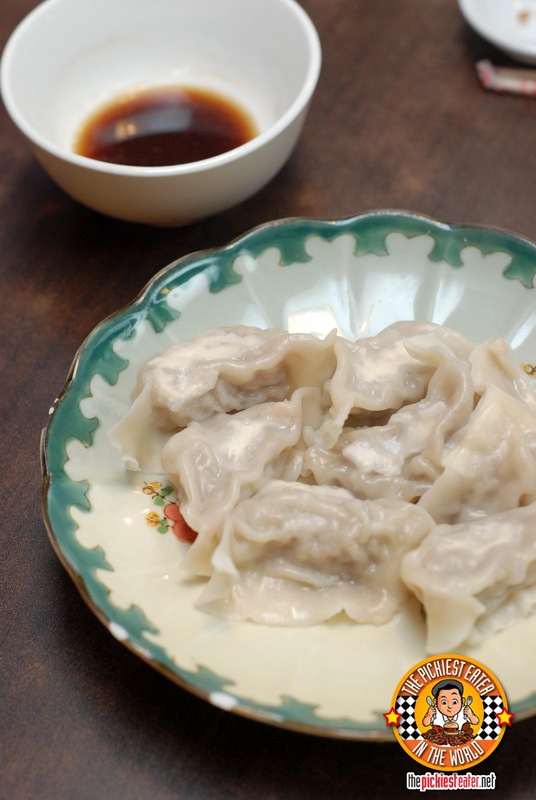 The dumpling itself may not exactly be filled up with meat, but it does not lack in flavor. Dipping it into the sauce they provide, which I think is just more or less soy sauce and vinegar, helps accentuate the flavor, however truth be told, it can stand alone on its own. 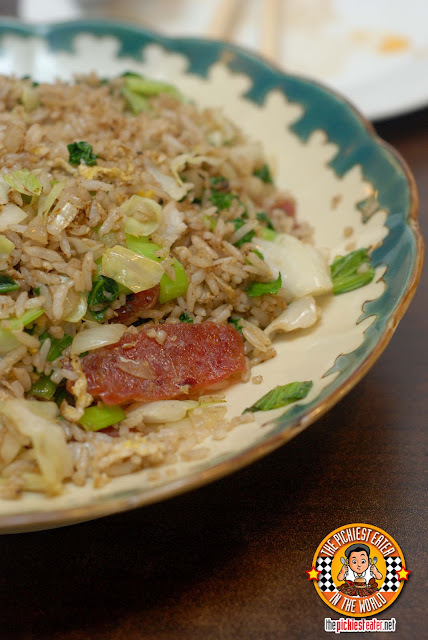 I loved the sound of their Chinese Sausage Fried Rice (P160) so I went with it. Rina isn't too found of Chinese sausage, but she seemed to like this. My initial reaction was that the Chinese sausage seemed to be scarce, but it turns out they were all pretty much buried under the rice (They can run but they can't hide!). When I scooped a spoonful into my plate, it a whole bunch of Chinese sausage slices fell out, it was almost like finding Pirate's booty. This could actually be a meal in itself, if you ask me. But then you'd be missing out on some wonderful dishes Kanzhu has to offer. For our main dish, I wanted to try their Kanzhu Special Braised Beef (P180) because I heard it's supposed to be their signature dish (The "Kanzhu Special" label in front of it kinda tipped me off.. You call that the power of deductive thinking, ladies and gentlemen). "Braised Beef" is a dish whose name I need to say slowly whenever I order it, because otherwise it comes out as "Braised Brief", and I'm getting tired of being laughed at by waitresses =( . I loved the cut of beef they used.. sort of like Short Rib without the bone.. but it had a nice ratio of fat to meat to it. The beef was tender enough, while the sauce had a wonderful spicy kick to it that brought out the natural flavor of the beef. Had I been eating plain white rice instead of the Chinese Sausage one, I would have drowned it in the sauce. This Braised Brie-.. sorry..- Braised BEEF dish was truly worth being Kanzhu's signature dish! As I've mentioned in the past.. Rina absolutely LOVES Pork Spareribs with Tausi, so when we're in a Chinese restaurant and it's on the menu, it's a given that it shall be ordered. Now that she's nearly nine months pregnant and hormonal, I had no intention of messing with that tradition. 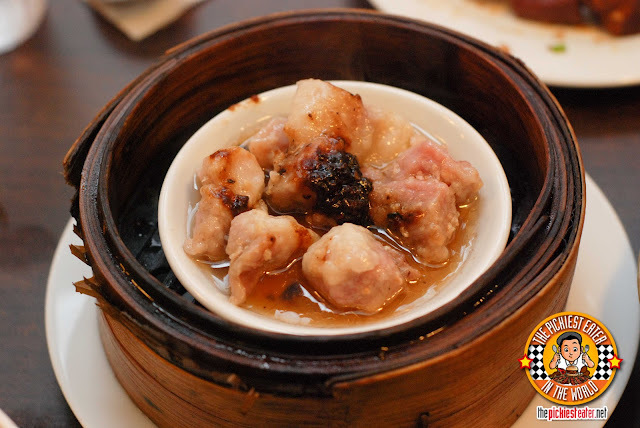 Rina believes that the true measure of greatness of a Spare ribs with Tausi dish is in the sauce. If she can take a sip of the sauce and it has so much flavor that it can be eaten alone with rice, even sans meat, then it gets a gold star in her book. 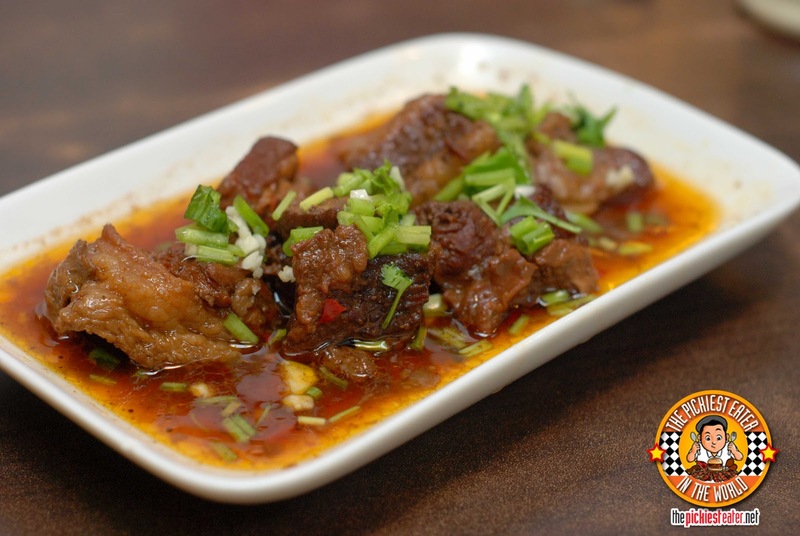 As soon as the waiter placed the Tausi Spareribs down on the table, she gave her spoon a quick dip into the small plate, and took a small sip of the soup. She then rolled her eyes to the back of her head and said, "Oh God". The last time I saw her make a face like that was nearly nine months ago, and we all know what happened after that, so you know it was really good ;) (hehe). Rina ranks this easily among the best Tausi Spareribs she's ever had, and I agree with her, 100%. The sauce alone was packed with flavor, and the ribs, had a healthy (or maybe not so healthy) amount of fat to keep it juicy, while the meat itself stayed tender. I would be insane If I go to a place that brags about their hand pulled noodles, so I ordered their Fried Noodles, while Rina, watching the effect Typhoon Quiel was having outside, was in the mood for some Hot Noodle Soup. 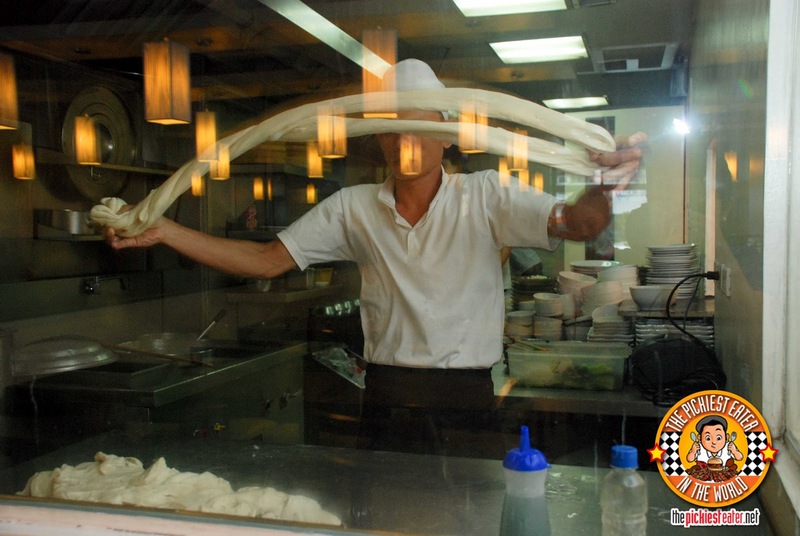 Once our noodle orders were placed, the waitresse informed us that the noodles itself were about to be freshly made, and we could watch them make it through the window if we wanted.. and of course we wanted. It came out all stringy like noodles! I thought they would need to put it through a machine to get them all separated, but somewhere between his pulling and spinning, he managed to turn a clump of dough into beautiful, fine noodles! It seriously felt like I just blinked and BAM! It was noodles! I didn't get a good view of how it was done in Crystal Jade, but I'm pretty sure it was along the same lines and techniques. No matter how fun it was to watch the noodle guy make noodles, his efforts would all be for naught if it didn't taste good. 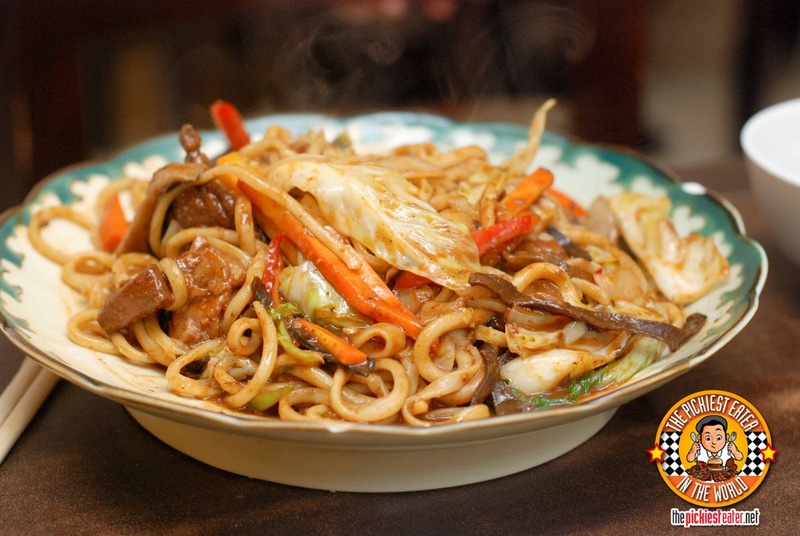 Luckily, the Beef Fried Noodles dish (P160) was fantastic. In retrospect, I think I should have ordered another meat with it instead of the Beef (They offered a lamb variation.. Darnit), because it tasted close to the Braised Br.. BEEF dish that I had just wolfed down. The noodles were absolutely perfect. They were very firm and thick (and I mean that in a non-sexual way) and was immaculately coated by the lightly spicy sauce. The aforementioned beef was present in huge chunks. It reminded me of the noodle dish I had at Singapore that I loved so much. I swear, I'm going back to try the lamb! I got Rina the Braised Beef and Tendon Noodle Soup (P160) which she enjoyed however couldn't eat very much of it anymore because having a 6 pound baby inside her womb limited her food intake capacity. Once again, the noodles totally nailed it. 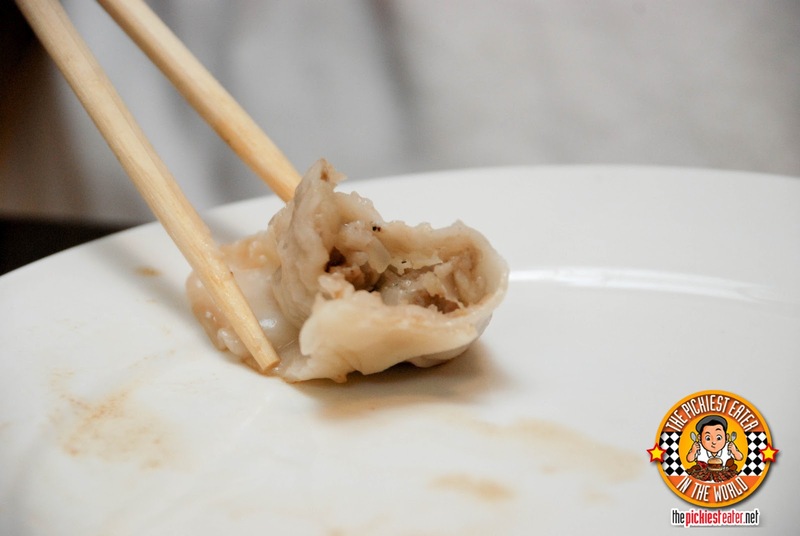 Thinner than the fried beef noodle dish, this was thinner yet had great consistency to it. The Beef Tendon virtually melted in your mouth, and again, was abundant in quantity. 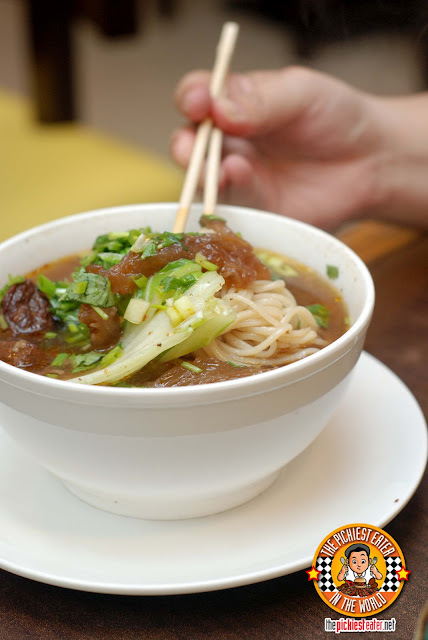 The broth had a great flavor to it, and the beef was also very tasty, making this a very hearty noodle soup that was perfect to eat on a rainy afternoon. With everything Rina and I ordered, we couldn't finish it all, so I had to call in for some reinforcements - Namely my cousin Pao and his girlfriend Jona. It turns out, only Pao could eat because Jona is a vegetarian (I hope we can still be friends)! 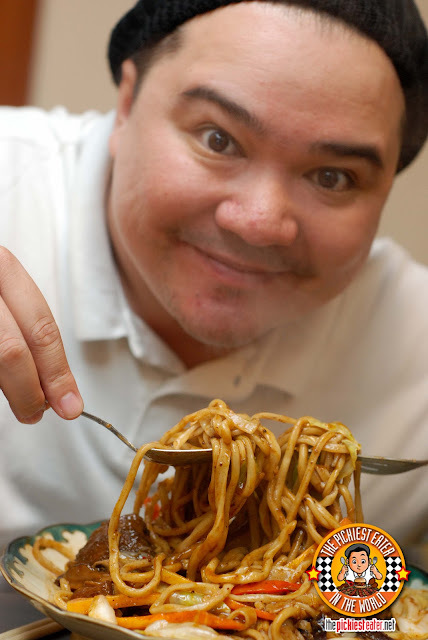 But even then, we STILL couldn't finish the noodles! He demolished the Braised Beef and the Sausage rice though..
With it's VERY reasonable prices and its stunning dishes, Kanzhu is Hand Pulled Noodles definitely ranks highly among the places to try When you're at Timog!